Celebrated annually on October 15, Global Handwashing Day was founded by the Global Handwashing Partnership, and is an opportunity to design, test, and replicate creative ways to encourage people to wash their hands with soap at critical times. The first Global Handwashing Day was held in 2008, when over 120 million children around the world washed their hands with soap in more than 70 countries. Since 2008, community and national leaders have used Global Handwashing Day to spread the word about handwashing, build sinks and tippy taps, and demonstrate the simplicity and value of clean hands. Each year, over 200 million people are involved in celebrations in over 100 countries around the world. Global Handwashing Day is endorsed by a wide array of governments, international institutions, civil society organizations, NGOs, private companies, and individuals. 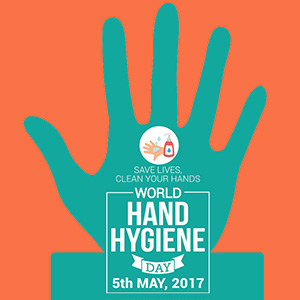 The 2017 Global Handwashing Day theme is “Our hands, our future!” This theme reminds us that handwashing protects our own health, but also allows us to build our own futures, as well as those of our communities, and the world. Because handwashing is an affordable, effective way to achieve these goals, by having the power to improve access to education for children, protect the health of patients and communities, and reduce inequities. Promoting the benefits and practice of handwashing with soap, as well as fostering access to and improving hygiene facilities, will help us work towards a future where that potential is realized. These resources aim to help you learn more, find out how you can participate, and prepare to have a fantastic Global Handwashing Day, wherever you are in the world.